VoLTE stands for voice over LTE and it’s more or less exactly what it says on the tin. It’s voice calls over a 4G LTE network, rather than the 2G or 3G connections which are usually used. We tend to think of 4G as mostly being about downloading, streaming and web browsing, and indeed that’s primarily what it’s been used for so far, but it can also be used to improve calls. 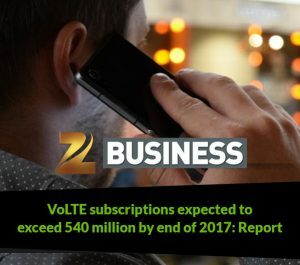 The rise in the VoLTE subscriptions is due to launches in China and India with more affordable VoLTE smartphones in India and this is expected to continue. The main reason for this is the emergence of Reliance Jio in India. Zee Business is one of the leading and fastest growing Hindi business news channels in India. Zee Business provides the latest business news such as Indian stock market news, sensex live news & nifty news. The channel has revolutionized business news by its innovative programming and path-breaking strategy of making business news a 24/7 activity as it is not just limited to the stock market. This has made Zee Business channel to wealth and profit. Besides updated hourly news bulletins, there is a lot to read & watch out for, whether it be stock market related detailed information, investments, mutual funds, corporate, real estate, travel or leisure. The channel has the most diverse programming portfolio which has positioned it as a channel of choice amongst viewers. By speaking a language of the masses, Zee Business is today the most preferred for business news. Vertoz is the complete advertising and monetization suite. Programmatic advertising comprises of automated media buying, placement, and optimization of digital advertising, where both supply and demand partners are free from human intervention. Vertoz is among the top programmatic company that offers engaging and innovative advertising and monetizing solutions. Amongst all the top ad tech companies, we empower a global roster of top advertisers and publishers- all under one roof. We offer one-stop-shop for you! We only talk about programmatic advertising technology and we cater out the finest ad buying system.